There are few experiences more fun than a wine expo. Good wine, cheese and a crowd that gets progressively friendlier as the day (and night) wears on. 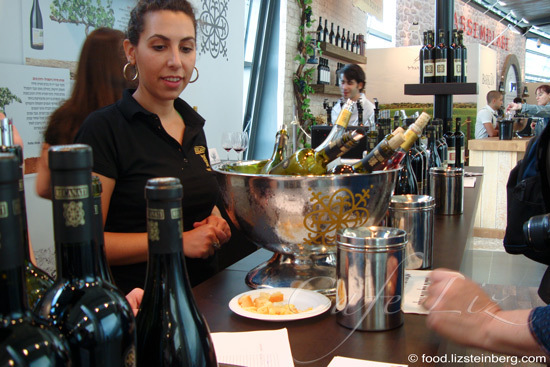 As a bonus, Israeli wines tend to be particularly alcoholic — the climate makes for sugary grapes, which in turn leads to alcohol content of as much as 14% versus 11% to 12% in Europe. 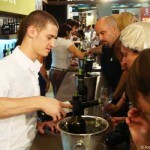 I’d been waiting excitedly for Sommelier 2011, the annual wine expo for the food industry, which was held last week. 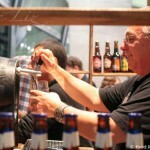 Dozens of wineries from around the country set up stands to woo restaurants and reviewers with their latest offerings. More Israeli wineries are offering wines made with grapes beyond Cabernet Sauvignon, Merlot and Chardonnay — there was lots of Malbec, Petit Verdot and Barbera, to name a few. This is a trend I thought I was noticing, and my friend Irene, of the Golan Heights winery, confirmed it — more wineries are trying new things, and some are doing it better than others. For instance, her winery unrolled a wine made from Portuguese grapes, named 2T — for the Touriga Nacional and Tinta Cao varieties. As usual, there was a surplus of good red wine — lots of wines I’d be happy to drink a glass of, but few of which stood out in my memory. While you could probably taste slight differences if sampling one after the other, I couldn’t describe most of them for you — many would just blend together under the general description of oaky tannins with berries. Irene noted that differentiating between these wines is where real wine expertise comes into play — something I admit I lack. Tulip White 2010 — a blend of 70% Gewurtztraminer and 30% Sauvignon Blanc (OK, I pretty much like any Gewurtztraminer) creates a mix of tropical fruit and crispness. Tulip Franc 2010 — this wine is made from a mix of Sauvignon Blanc (35%) and Cabernet Franc (65%), which actually happens to be a red grape. But the peels aren’t left in contact with the juice, enabling the winery to make this into a white wine. The winery describes this wine’s flavor as containing strawberries, apples and citrus. Agur Blanca 2010 — a mix of 55% Viognier and 45% Johannesburg Riesling, this dry wine has a sweet smell — something I like in white wines — and a taste I found grassy and earthy (the winery describes it as dried fruit and citrus). Yatir Viognier 2009 — I thought this wine had a fruity apple bouquet and a grassy licorice taste, which I found interesting. Golan Heights Heightswine 2008 — Am I uncreative for liking this wine? It only won top award at the wine “world cup,” as Irene put it. This Gewurtztraminer dessert wine is styled after a German ice wine, but since the climate here is not such that the grapes freeze on the vine, the winery freezes them itself. It’s a very sweet wine, but it has an amazing mix of flavors including tropical fruits, vanilla and flowers. 2008 is on its way out, but later vintages are available. Binyamina Reserve Gewurtztraminer. Have I mentioned I like Gewurtztraminer? I enjoyed drinking this one too. And here’s one red wine to end the list: Recanati Reserve 2009 Petite Syrah/Zinfandel. The winery describes it as a characteristic “Israeli” wine, but I think it’s better than average, with a prominent smell of cloves and spices. It’s made from 80% Petite Syrah and 20% Zinfandel. I was joined at the expo by a great group of bloggers — the usual suspects — some of whom already wrote about the event. You can read Katherine’s blog post and wine reviews, and Yael’s review (translated from Finnish). 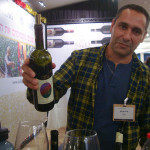 New Israeli wine recommendations (and new beginnings) Wines (and other things) I liked at the 2010 expo What makes a beer Israeli? 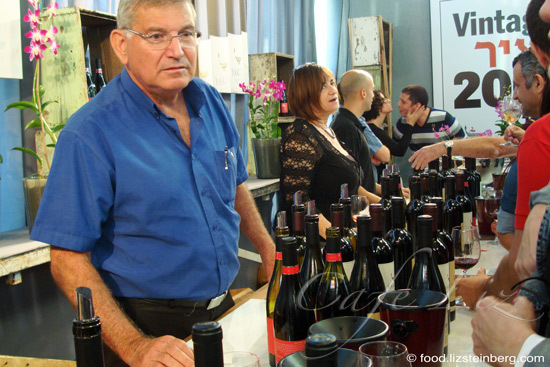 7 Responses to "Six Israeli white wines I like (and one red)"
I also attended and thought the event was great. I just wanted to point out that that the Tulip Wine is kosher as well (starting with the 2010 vintage, all Tulip wines are kosher) and I agree – fun wine! 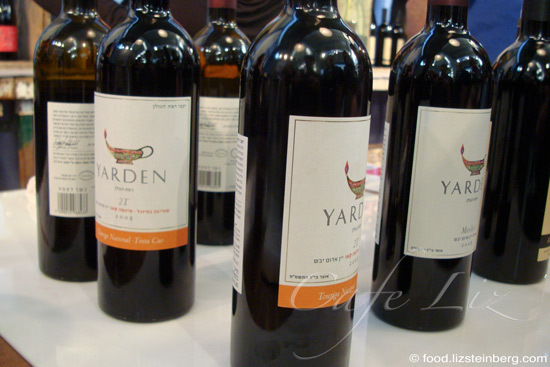 If you liked the Yarden Heightswine, I highly recommend finding a bottle of the “icewine” styled wines from Gat Shomron – they have one based on Viognier and another one from Gewurztraminer – both excellant! Thanks, Yossie, for your recommendations and for the update about Tulip — someone just pointed that out to me, I’ll be fixing it in the piece. The Sommelier exhibition this year was really great and it was nice to see you again.I pretty much liked the same wines than you;the Gewurtztraminers were all so lovely! I see we have the same taste in wines. I love the Golan Heights Gewurtz, it’s my favorite. And a few years ago we treated ourselves to a rare bottle of Heightswine, the 2007, I think. I became an instant fan. I don’t normally drink red wine since it gives me migraines, but I want to try the Recanati you suggested, it just might be worth the headache. I was all set to go to the expo but in the end had to work until late and didn’t have a designated driver. Bassa, sounds like I missed a good thing. You should definitely come next time, you can always take a bus home — that’s what most of the others did.